Straits Times recently updated their mobile website paper reader to be a non-flash based solution. This allowed mobile users, especially Android users to a full paper access if you are a paid Straits Times digital subscriber. Touted as the first SPH-mobile ereader, the new mobile website is an alternative way to read the Straits Times on your portable device. Previously, digital access to the full Straits Times paper was limited to either iOS users or desktop / laptop users. Android users were pretty much left in the lurch. 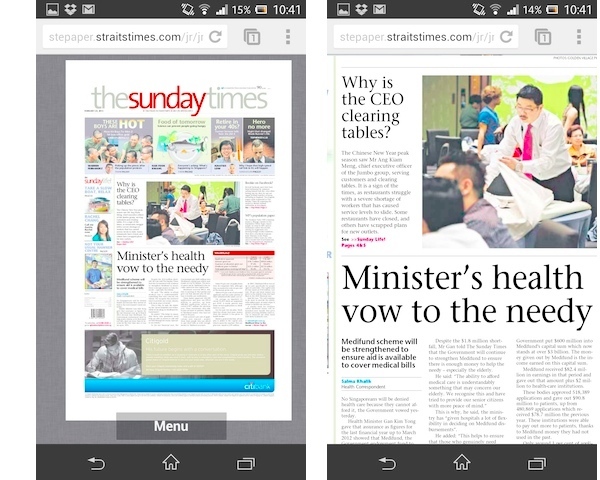 Now with the new update, you could access the full Straits Times paper via your Android browser. This would also apply to Windows Mobile and Blackberry users. The old eReader which still exists was build off Adobe Flash which most smartphones and tablets have limited/no support and even if enabled on Android, loading the FV Express was just way too slow. For the new eReader, browsing would be through the entire snapshot of the paper which allows you to see the broad headlines and then you could zoom in to the article. It worked great when tested on the Sony Xperia Z and the Chrome Browser and there was only a slight slowdown when zooming in, which could be attributed to the constant data access. The iPhone app has the advantage of downloading the entire paper for offline reading subsequently. Straits Times access could be up to 2 devices in total concurrently. 2 mobile device, depending on the subscription type. Mine was the old iOS account and hence I couldn’t login via the Straits Times Android application, but the application itself is quite limited compared to the iOS counterpart. For other newspaper access: TodayOnline has developed iOS applications for the iPhone and iPad but Android users would have to wait awhile longer. The TodayOnline applications have generally received improved reviews and allow access to the mobile-designed articles and also the full PDF. Alternatively, there are other options, such as the paid access of PressReader which caters to overseas Singaporeans. We are still reviewing PressReader and will cover that shortly.